If you have been following the blogtour for this book, you will know by now what a very special book it is. I have read a couple of Isabelle Broom’s books before and can honestly say that I think this is her best yet. It’s a book about two people becoming the people they are always meant to be, becoming the best versions of themselves, a real meeting of minds. Alice is on holiday with two of her friends, Maureen and Steph, all of whom celebrate their 30th birthdays within the space of a few days while they are on the trip. They meet and team up with Max and his friend Jamal almost as soon as they arrive. Neither Max nor Alice are looking for any kind of relationship. Alice is already in a long-term steady, if rather uneventful, relationship. Both have had accidents in the past which have changed them in some way. Alice’s accident had led her mother to become overprotective and for Alice to suppress the outgoing, adventurous side of herself, settling for a quieter, more mundane life. Max’s accident was much more life-changing and had made him strive to become a better version of himself, someone more determined to live life to the full. Both main characters were very easy to like from the outset. Max is incredibly strong, brave and resilient although his moving poetry gives insight into his darker days. I liked the way that he clearly had no self-pity nor did he want anyone else to see him as anything but an everyday guy. Alice was perhaps more complex as she was really just beginning to open up to the possibility of changing her way of living and becoming more the kind of person she knew deep down she was, not suppressing her outgoing nature any more. It was lovely to see her grow throughout the book. I liked the other characters too. Jamel is the invaluable and supportive physiotherapist who became Max’s closest friend. Alice’s friends were great fun to read about although Maureen could be a little annoying at times! The heat, the colour, the noise and the beauty of Sri Lanka are all vibrantly described. I see from the notes at the end of the book that the author has visited and she has brought her her experiences vividly to life on the page. From a little Twitter chat we had I also know she took part in the same adrenaline packed activity which Alice does in the book and I can only say she’s a braver woman than me! But it does explain why the experiences of the travellers in the book seem so authentic. 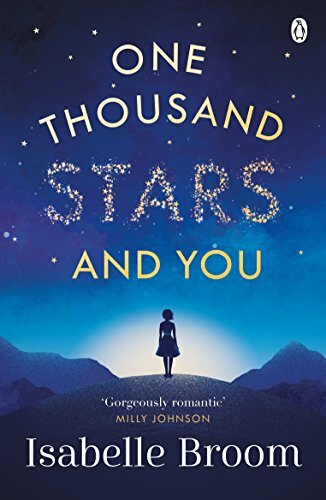 One Thousand Stars and You is one of those books where I just want to say go and buy it. It’s a beautiful, romantic, enchanting story and I didn’t want it to end. I loved the main characters, I loved reading about their experiences and I love the way their stories ended. All in all, it’s fair to say that I just adored this book! Isabelle Broom was born in Cambridge nine days before the 1980s began and studied Media Arts in London before joining the ranks at Heat magazine, where she remains the Book Reviews Editor. Always happiest when she off on an adventure, Isabelle now travels all over the world seeking out settings for her novels, as well as making the annual pilgrimage to her true home – the Greek island of Zakynthos. Currently based in Suffolk, where she shares a cottage with her dog Max and approximately 467 spiders, Isabelle fits her writing around a busy freelance career and tries her best not to be crushed to oblivion under her ever-growing pile of to-be-read books. Wonderful review, sounds like one of the heart warming books!